As you age and become unable to manage the tasks of daily existence (cooking food, shopping, using the toilet independently, cleaning, and personal grooming) there are few options for a well-lived life. Assisted living offers some autonomy — but not nearly enough when you’re forced to rise, dress, shower, and eat on a pre-determined schedule meant to create institutional efficiency, not happy, fulfilled, human beings. 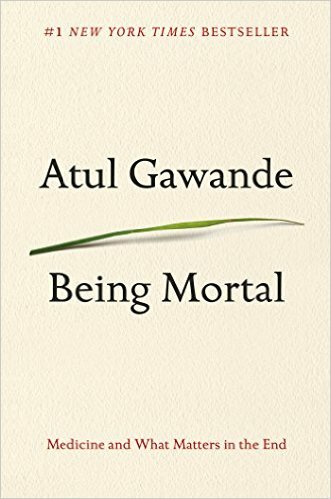 Gawande’s book challenges the institutional default setting by profiling small-scale, successful assisted living communities that allow elderly and frail people to do the things that bring them happiness on a schedule they choose. For the terminally ill, the treatments are often much worse than the illness itself, although science’s default setting is try everything, to exhaust all options — even when death is an eventuality. Gawande suggests doctors should seek to understand what’s most important to patients, their fears, and the trade-offs they’re willing to make when considering treatments that can never cure, only extend life. Well-being is about being able to live the life you want to live and do the activities you want to do, on your terms. It’s about ice-cream in front of the hockey game at home, as opposed to wasting away in a hospital as disease takes over. It’s about maximizing comfort and the quality of the time remaining, as opposed to focusing on mostly useless treatment. This is a book I’ve seen advertised though I’d bypassed it several times. I’m so glad that I read it. Reading it, I reflected on how difficult it was for Mike’s family when his mom was diagnosed with pancreatic cancer. Although we really could have benefited from reading this book over 20 years ago, we did what we could to help Joan enjoy the time she had left. There were trips to the lake, lots of chocolate milkshakes, and most importantly, time with friends and loved ones. Reading this book has also made me think of what I want for myself and my loved ones was we all age and eventually become frail. Being Mortal has equipped me with a set of questions to consider when time is running short, to help reveal fears and hopes and help choose which to live and make decisions by. Not only has it helped me to think about the (hopefully!) long-term future, it’s helped me to re-evaluate how I spend my time in the present. Each day of my sabbatical is a gift. I get the exquisite luxury of being able to choose precisely how I want to spend my time each day. I’m fortunate to be in good health and the fact that I can run, bike, read, and sit on the deck and listen to bird radio has been a tremendous joy. I’ve been able to think about my life, what I’ve done so far, what’s most important to me, and how I want to spend my time going forward. Being Mortal is an excellent read and it couldn’t have come at a better time. Highly recommended!